Jazz. Blues. Hip-hop. Names to describe musical genres. Really just labels to better catalog and locate the kind of music that gets our rocks off. It's why the typical answer of, "everything," to the eternal question, "what do you listen to?" is so maddening. It's never true and worse a thoughtless cop-out. Nobody can genuinely like everything. The ability to formulate distinctions is the very essence of taste. In the first installment of (what I hope) will be a recurring feature, Explorations in Subgenres, I'm pointing my spotlight onto a previously uncategorized style that falls between hard rock, southern rock, and blues rock: Booze Rock. Picture yourself with your best pals in a southern-flavored dive, drinking and carrying on. The bottles are dusty but the liquor is clean. The wood paneling and beer on the floor assure that pretension has no place here. A rock 'n roll band has turned out and there's a dance party coming alive. This is booze rock. The British have an uncanny knack at emulating the American blues sound. It was the English reimagining of '50s rhythm and blues—in the form of the British Invasion—that reignited rock 'n roll's popularity, especially in America. Don't get me wrong, American rock 'n roll was very much still around. Artists like Chuck Berry, Wilson Pickett, Little Richard, to name a few, continued churning out what we now consider rock standards, but they were largely ignored by mainstream audiences. Early 1960s America was a racially segregated society, and regrettably that dubious distinction applied to music-listening proclivities of the public at-large. The postwar youth of the United Kingdom, however, was not as bedeviled by racial blindness—at least musically speaking—as their American counterparts. Appreciating that jazz, blues, and rock 'n roll were Black American inventions, the British youth realized their most genuine expressions came from that oppressed community. Infused with the likes of Willie Dixon, Muddy Waters, the aforementioned Chuck Berry, and many, many others, guys by the names of John Lennon, Keith Richards, Jeff Beck, to name a select few, were early in their careers simply trying to emulate their idols. The irony of them being barely post-adolescent Britons trying to act like seasoned African-American bluesmen did not occur to them, at least they didn't let it show. They wanted the real thing, and they knew it when they heard it. Savoy Brown was and they still are today an English band that since their inception concentrated on the blues aspect of of blues rock. In 1971, guitarist Dave Peverett convinced fellow Savoy Brown bassist Tony Stevens and drummer Roger Earl to start their own band, Foghat. Lonesome Dave, as was his wont to be called, recruited Rod Price aka Rod the Bottle, an ace slide-guitarist to join up. Their work over the next decade embody the booze rock sound. These guys kept it simple: swinging rhythms, standard blues themes, and a raucously energized approach. Their first hit is a blazing cover of Willie Dixon's "I Just Want To Make Love To You." Drenched in the blues, Foghat's English origins are obscured considering how thoroughly American they sound. Through the early to mid '70s, Foghat churned out solid, if unextraordinary, booze rock records. They were loud, fast, and fun. Mixing originals with fierce covers of Big Joe Turner, Buddy Holly, and Robert Johnson, Foghat hit their peak with Fool For The City (1975). Known mostly for its iconic front cover and the enduring driving classic "Slow Ride," Fool is a powerhouse rock album by any standards. Side 1 is a masterpiece of rock guitar composition and performance. The title track with its elements of slap bass guitar and free-for-all vocal delivery opens the record with an unexpected invigoration. They segue immediately into a cover of The Righteous Brothers' "My Babe," a marked and catchy improvement on the desultory original. Side A concludes with the epic "Slow Ride" which can be viewed as booze rock's "Stairway to Heaven." The true highlight of the record is the electrifying cover of Robert Johnson's "Terraplane Blues" on Side 2. Rod the Bottle throttles the slide guitar and the beat is just slow enough allowing him to scratch every last itch. It's a searing rendition. Pick up any Foghat record and if you see a blues or '50s rock cover, it's guaranteed to be a powerhouse. 1969 also marked the year the influential British blues band Small Faces splintered, leading to the genesis of two new groups that would both espouse the booze rock sound. Steve Marriott left Small Faces in 1969 to start Humble Pie. 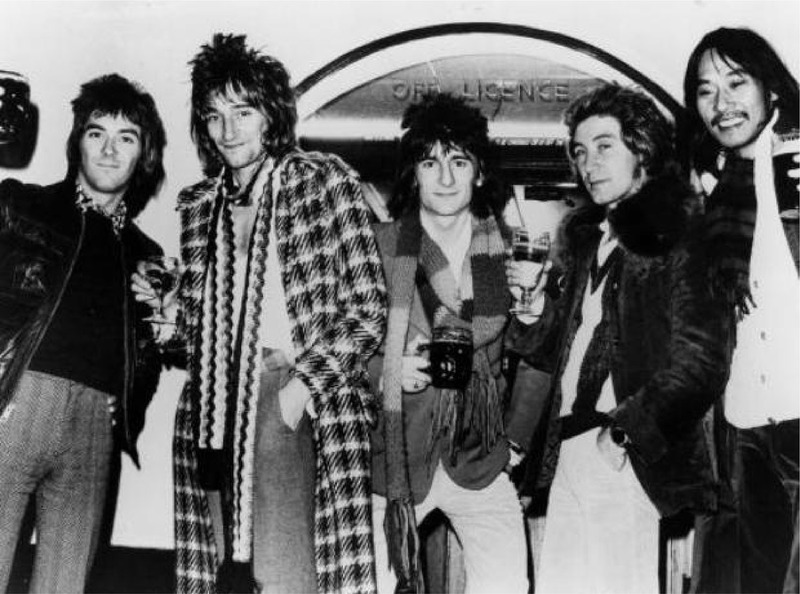 Meanwhile, Rod Stewart and Ron Wood joined and the band were rebranded as just Faces (since Stewart & Wood were, at 5'9 and 5'10 respectively, taller than the rest of the group). Faces, featuring a young Rod Stewart with his soulful hoarse voice coupled with crunchy guitar licks, quickly gained a reputation for their debaucherous concert tours. From a vocals perspective, Steve Marriott and Rod Stewart are the ideal booze rock lead singers. Loud and raspy with distinctive inflections, these guys have gone down as perhaps the finest rock vocalists the United Kingdom has produced. Humble Pie's "30 Days In the Hole," a big hit in 1972, is another great booze rocker. Coincidentally enough, the song is about getting loaded...then paying the price. Although the three bands I most identify with the subgenre hail from across the pond, American variants certainly exist. We invented all this stuff, after all...we just didn't learn to appreciate it without a little help from our friends. Rock based on the Texas blues is closely aligned with booze rock. Bands like ZZ Top and the Fabulous Thunderbirds took the Texas blues and injected it with velocity and expansiveness, while guitar virtuosos Johnny Winter and Stevie Ray Vaughn wailed their axes to climax. Of course, Lynyrd Skynyrd easily falls within the booze rock label, as do George Thorogood and the Destroyers whose biggest hits are drinking songs, they just happen to lean more southern. To top it off, Australians AC/DC rode the booze rock ethos to 200 million sold records. If you like your rock raunchy with a steady groove doused in whiskey, look to Foghat, Faces, and Humble Pie. You got that right! A friend once noticed the members of Foghat are drinking in a hotel bar years ago. Coming up to them, he exclaims, "Oh man, Foghat! You guys rock!" Dave Peverett shook his hand and smiled. "Thanks," he said, "but it's not Fog-hat, it's Fug-it."